"For me personally, the exceptional and irreplaceable nature of the EA, which I led for twenty years, lies in openness, in an attempt to cross borders and look for wider contexts, in the process of learning: between the personal, local and global; between praxis and reflection; between the rational, the spiritual and the ethical. I think this is a good direction." - writes Jiří Silný, the founder and former director of Ecumenical Academy, in the text The Ecumenical Academy and its journey, which summarizes the 20 years history of the organization. 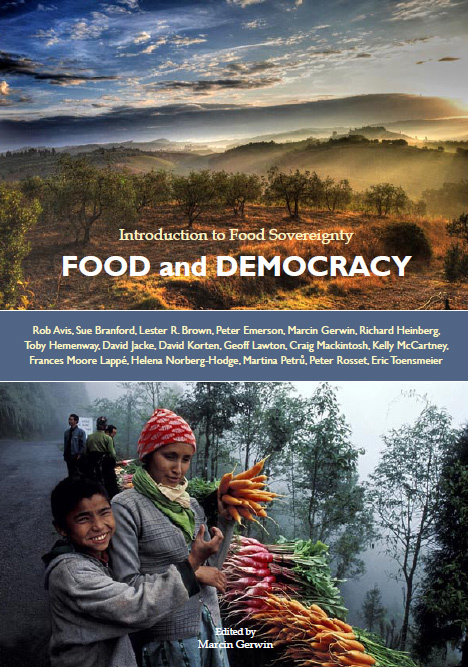 Book "Food and Democracy: Introduction to Food Sovereignty"
The book “Food and Democracy: Introduction to Food Sovereignty”, published by Polish Green Network, is a collection of articles, written by renowned experts, on various aspects of food sovereignty. The articles present the biggest challenges related to feeding the world in the XXI century, explain the need for the participatory democracy in dealing with the problem of hunger, and show how the principles of food sovereignty could be realized along the food chain, starting with access to land, then on a farm, and in a local economy. A big part of the Academy’s educational as well as practical activities is connected to the issue of alternatives to the so-called free trade. The article was written thanks to the project “Central European partnership for sustainable agriculture and food sovereignty”, co-financed by International Visegrad Fund. Project “Central European partnership for sustainable agriculture and food sovereignty”, co-financed by International Visegrad Fund, brings together organizations from Czech Republic, Hungary, Poland and Slovakia. Ecumenical Academy Prague is one of the project partner. The objective of the project is to build partnership and strengthen cooperation among non-governmental organizations from the Visegrad Group countries in the field of supporting fair, sustainable and ecological food production and consumption both in Europe and in the Global South. The Ecumenical Academy Prague (Ekumenická akademie Praha – EAP) has been concerned with the matter of sovereign debts since the end of 1990s. The article was written thanks to the project “Central European partnership for sustainable agriculture and food sovereignty”, co-financed by International Visegrad Fund. Over the past months a wave of suicides has occurred at the Foxconn plant of Longhua in southern China. 12 employees all between 18 and 24 years old have attempted to commit suicide; reportedly 10 workers have died, two have survived but suffer injuries. Foxconn is a Taiwanese electronics giant, manufacturing for all major global electronics brands. What has happened to workers in the supply chains of Nokia, Philips, Panasonic, IBM, HP, Lenovo, Sanmina, Jabil and Flextronics in Mexican factories during 2008 and 2009? 6000 jobs lost, massive dismissals, a 10% reduction in wages, an increase in temporary three-month and monthly contracts for workers in the industry from 40 to 60%. Hewlett-Packard pledged to stop using dangerous plastics in its computers by 2009. It broke that promise. Will a company-wide voicemail from William Shatner make it change its mind? environment and society for a long time.